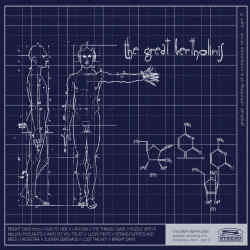 German-Hungarian band The Great Bertholinis have made themselves already quite a reputation in the world of indie pop and rock music. Their name may sound like a circus troupe, and why not?, because the eight musicians have certainly fun playing their music. After their last album Planting A Tree Next To A Book came out last year, they were compared to Calexico, but The Great Bertholinis sound less dusty and much more colourful. Their new CD Gradual Unfolding Of A Conscious Mind (Part 3) begins with the sad minimalist intro Bright Days, before Run To Hide unleashes their Balkan influences. This stew of fanfare, klezmer and gypsy music is pure fun, and the rhythms make it hard to sit still. On I Am A Can, the band knows no limits and sounds like a Beatles hit from 1967. There are certainly moments of melancholia, but the fun parts prevail. I can’t help thinking of Dresden Dolls, Jellyfish, Belle & Sebastian and Gorky’s Zygotic Mynci, but The Great Bertholinis always retain their own sound. Especially the strong use of horns should be considered one of their assets. Towards the end, two incredibly amazing tracks full of melancholy (Lost The Key, Bright Days) dig themselves deep under your skin. A pop rock album definitely can’t sound any better. The Great Bertholinis are never in lack of ideas and are brimming with fantasy, melancholy, folklore and many more surprises that everyone should find something to like. Most bands should learn here a lesson, because with The Great Bertholinis, nothing ever sounds merely warmed up.